3.6 out of 5 based on 218 bloggers and 36 commenters. 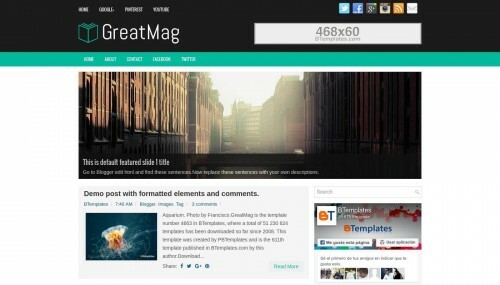 GreatMag is a free blogger template adapted from WordPress with 2 columns, responsive design, seo friendly, right sidebar, fresh look, ads ready, footer columns, slider, social bookmarking icons, posts thumbnails, breadcrumbs and related posts support. Excellent template for blogs about any general topic, books or business. Very crafty template, well designed and super cool. Go to theme, klik setting “mobile” and klick “No. Show desktop theme on mobile devices.” and save. Review your blog in a mobile phone. 1- How can I modify the blog width? 2- How can I add submenus (drop-down menus)? This is a nice template. I will want to change my template to this but am worried about how it is optimised for speed. The current one I have on my blog have a Google Pagespeed score of 67/100. Is it faster than this score? Is this theme on your site 100% free? Seus templates são lindos, e o que é mais importante, são confiáveis. Obrigada por compartilhar e dentro do possivel vou indicar os seus templates seguros. Muy buenas, queria hacer una pregunta. Actualmente estoy usando este template y me gustaria saber si en las pestañas de nuestro menu horizontal de la parte de arriba, seria posible poner categorías dentro de las pestañas, o pestañas dentro de las pestañas. Exelente diseño, queria preguntar como puedo modificarlo, como agregar submenus he intentado varias veces, he visto tutoriales pero en verdad no he podido y si me gustaría mantener el diseño. How can I add submenus (drop-down menus)? How can i change slide show?Its a nice tamplet..i want this but how can i change slide show? Great Theme For my Hindi Blogger Blog. I feel so good , its clean and best theme I ever seen. hi, how to make the header sticky/floating? how do you add submenus? Nice template it is ascetic.